Glamoursplash: What do You Collect? I just love it when I find a new site that is chock full of useful information, easy to navigate and run by fabulous folks. The other day I stumbled across The Collectors Weekly. I don't recall how I ended up there or what my path was, but I do spend some of my time on-line doing research. I got sucked in. Their tagline, 'what do you collect' hooked me right from the start. In my mind whenever you have three or more of something that is similar, you've started a collection. I've got many collections; sock monkeys, marbles, copper plates, vintage glassware, vintage patterns, but by far my favorite is vintage swimwear. The site has some fabulous informational articles on all types of old things. Just this morning I read an article by Lizzie, a colleague of ours, titled Collecting Vintage Sewing Patterns. Lizzie always surprises me with her wealth of information and yet again I learned something from her. Umm yeah, I have a collection of sewing patterns too. Next I found an article by Miss April on The In's and Outs of Buying Vintage and then yet another fascinating article by Amy Carol on Vintage Fashion, Sewing and Aprons. Ack! I have a stash of vintage aprons as well. So needless to say I'm spending time on this wonderful site and I've only just scratched the surface. The site is very user friendly interactive and has a link 'suggest a site', which I did and low an behold less than 12 hours later I get an email from Dave Margulius telling me a vintage swimwear section had been added. Wow, I was floored, and what a bunch of eye candy I see. I feel like a kid in a candy shop. But I have to say I am a HUGE customer service aficionado, it counts very high on my rating system. Give me good service and I'm a very loyal customer. So when a site I had no idea even existed, could turn around a request of mine and actually make it a reality in less than 12 hours, well, I'm just over the moon. Maybe someday I'll be able to do a guest column for Collectors Weekly. But I gotta say, if you collect anything, chances are they can help you find more to add to your collection, or at least expand your knowledge. i love to see others collections but im not a collector myself! its odd though i think everyone that knows me thinks i have a bizillion items from past eras but i dont. 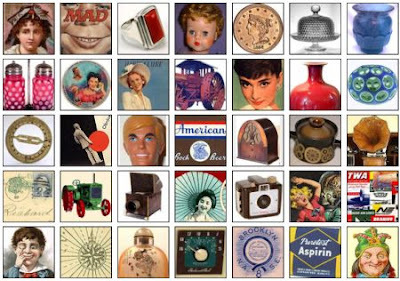 there are plenty of eras and objects that i adore and love to look at but just dont have to have them -its weird!